3rd International Theatre Festival "Five evenings in Cyprus". Dmitry Dyuzhev - famous Russian actor will give the audience the most famous and most significant work of the great Russian poet Aleksandr Pushkin “Eugene Onegin”. Pushkin's masterpiece has not lost its popularity and is still loved and revered by millions of people. Of course, such a performance is one of the most interesting genres, where the performer together with the audience reinterprets old Russian life. Each performance is made "here and now" and therefore is an absolutely unique. 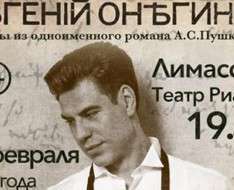 The play will feature the music of the outstanding Soviet composer Sergei Prokofiev, written especially for the play "Eugene Onegin" in the famous Chamber theater. Exquisite and spiritual performance "Eugene Onegin" performed by Dmitry Dyuzhev will not leave anyone indifferent and will help to re-evaluate the masterpiece of world literature. Within the third International Theatre Festival "Five evenings in Cyprus"